The Molex to SATA adapter makes it simple to connect your SATA hard drive to your existing 4-pin power supply. This 4-pin Molex to SATA adapter allows you to take advantage of the most sophisticated hard drive technology without having to upgrade to a new computer. In seconds flat you’ve got a reliable connection you can depend on for years of outstanding performance. 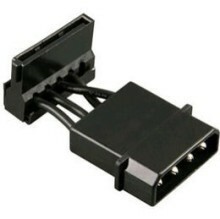 Click the button below to add the 4 Pin Molex to SATA Power Adapter to your wish list.